On a warm spring or summer day, there's one thing that's sure to please nearly everyone: playing in the water. And that's what free spray parks are all about. For spray park splashing in the South Sound, here's our guide. Try them all and let us know if we missed your favorite! Metro Parks Tacoma's 10 spray parks are already open weekends and may be open on extra-hot weekdays before May 30, when they'll be open daily for the summer season. Lots more details below! Closer to Seattle or heading on a day trip? Don't miss our guide to our guide to spray parks around Seattle, the Eastside and North Sound. Kiwanis Kids Spray Park: One of the South Sound's newer spray parks, and Puyallup's first, replacing the wading pool that used to be in Pioneer Park. Find it: 324 S Meridian, Puyallup. Hours: Open seasonally, noon–10 p.m.
Find it: 5005 Ruston Way, Tacoma. Norpoint Park: With landscaped rain gardens, eco-turf and a playground as well as sprayground, there are many reasons to visit Norpoint. Hours: Open weekends through May 30 and daily thereafter, 10 a.m.–8 p.m.
Wright Park: In northeast Tacoma, this beautiful park boasts an updated playground and an almost one-mile trail. Explore the W.W. Seymour Botanical Conservatory while you're there. Jefferson Park: Spanning over 15 acres, this park has a recently renovated spray park and playground, plus athletic fields. Verlo Playfield: Have a picnic after the kids work up an appetite splashing in the sprayground. Note, some still know this playfield by its former name, McKinley playfield. South Park: The trees at this forested park provide plenty of shade when you need a break from splashing or strolling the gardens. Wapato Hills Park: The Skip & Laura Vaughn playground and sprayground at is adjacent to a preserved open nature space. 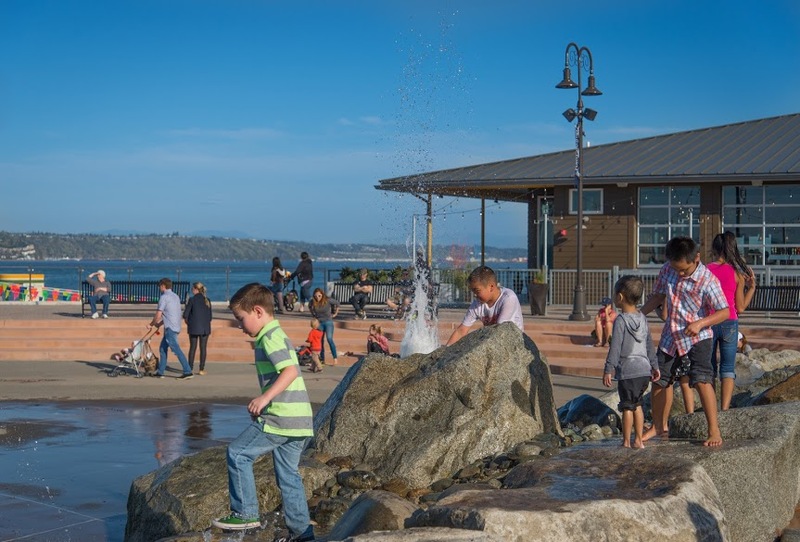 Titlow Park: This 75-acre park on Tacoma’s westside boasts a spraypark, lagoon, a recently updated playground, and basketball courts and playfields. Tip: Come on a low-tide day and get schooled on starfish schooled by the Tiptoe Through the Tidepools program, held at Titlow Beach about once a month in the summer. Find it: 8425 6th Ave., Tacoma. Franklin Park: This park has a newer sprayground, walking trails and expanded community garden. Kandle Park: Kandle Park, which also boasts a huge outdoor wave pool, has a free mini-sprayground, spray toys, and a separate spraypool. East Bay Public Plaza: This unique reclaimed water stream in front of Hands On Children's Museum has water to spare, stepping stones to climb on and much more. Check the website for occasional closures before heading out to avoid disappointment. Hours: Open seasonally, daily 10 a.m.–8 p.m.
Les Gove Park Rotary Play Sprayground: The colorful water-spray features here make it one of the most popular spray parks in the area. Tip: Les Gove also includes the terrific, fully accesible Discovery Playground. Find it: 910 Ninth St. S.E., Auburn. 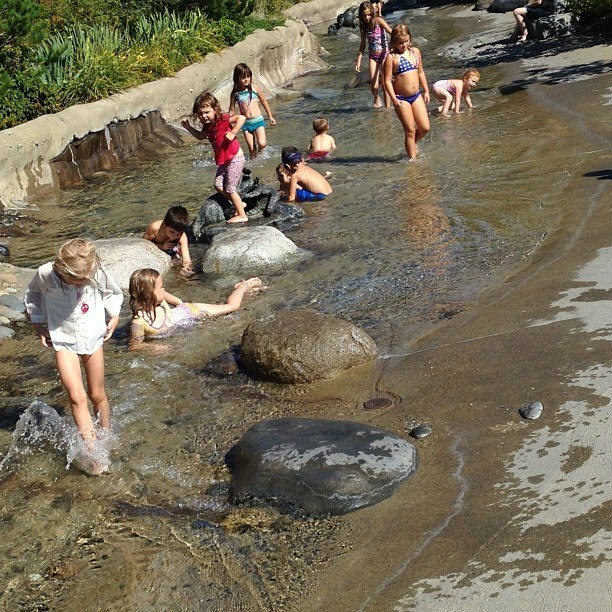 Point Defiance Zoo & Aquarium: If you visit in the summer, bring a change of clothes and water shoes so the kids can splash in the Kids’ Zone Lilypad Fountain. Editor's note: Elisa Murray contributed to this article, which was originally published in 2013 and updated in May 2018.